Last November, we informed our readers how Goldstriker, a company that specialize in dipping smart phones in gold and platinum, had gone ahead with production of $3.2 Million "iPhone 3GS Supreme", which grabbed the title of world’s most expensive cell phone. 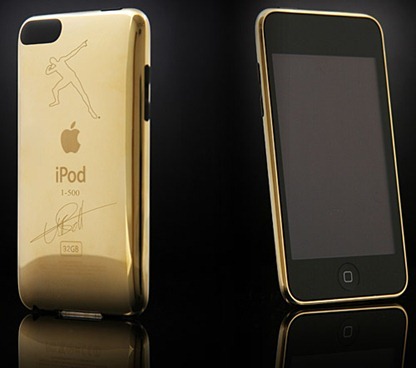 This Limited Edition "Usain Bolt Gold iPod Touch" is embellished in 24ct Gold. Each iPod touch is Laser engraved with Usain Bolts signature and comes with a LIFE TIME GUARANTEE against any scratching or fading..
And now another company named Goldgenie, today has launched a gold coated iPod touch to pay tribute to the great Jamaican athlete Usain Bolt. To honor this great star, his signatures and his pose of triumph has been engraved with Gold on the surface of the device. Usain Bolt’s signature laser engraved and famous “pulling of the bow” pose. For those of you who don’t know, Usain Bolt, 23, is a Jamaican sprinter and a three-time Olympic gold medalist. He has set new world records in the 100m, 200m and 4x100m relay at the Beijing Olympics in 2008 and followed up that feat last year with three more gold medals and two more world records at the World Championships in Berlin. These special devices released in the honor of Usain Bolt, are of course, in limited production. A total of only 500 sets are available with each priced at about US $550. You can follow us on twitter or join our facebook fanpage to keep yourself updated on all the latest from Apple Inc.